Nearly 20 years ago, God gave me a vision at a dark time in my life and ministry. Ironically, it was “officially” starting and I had already been ministering since a child but while the ink was still drying on my ordination it seemed like things were falling apart. Satan was already trying to derail God’s assignment but looking back I am in good company – Jesus and John The Baptist had the same thing happen to them and countless Christians since. The Lord showed me that I would one day minister to a sea of people overseas. WORD to the WISE: Never doubt in the dark what the Lord showed you in the light (Dr. Adrian Rogers). That vision was a blessing that kept me moving forward by faith. Sometimes God answers prayer over night but other times it can take weeks, months, years and now fast forward just shy of two decades. Yes, I have been beyond blessed and ministered overseas at various churches, conferences, cruises and crusades but I kept thinking of the vision God gave me. Not because I was ungrateful but trying to see in reality what God showed me by faith. 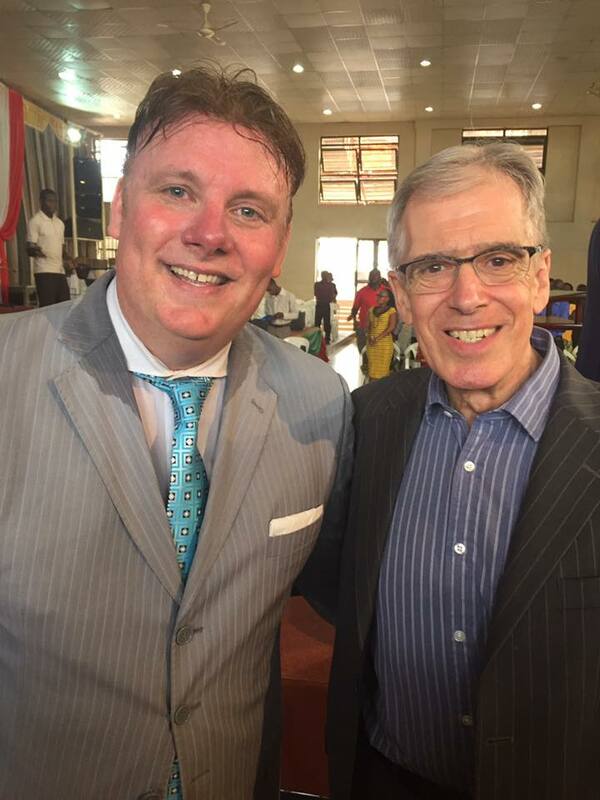 Last year, my dear friend Pastor Chuck Balsamo was invited to speak at the iconic Nelson Mandela National Soccer Stadium in Uganda, Africa on New Year’s Eve! I saw it spread like wildfire on Facebook as the video went borderline viral and I recall being so proud of him! I wrote a couple of encouraging messages on his wall and was so excited to see how God used him. Nothing more – nothing less. I learned long ago that we can be INSPIRED by others we should never be INTIMIDATED. If God did it for one perhaps he would do it for another? When he returned he contacted me noting, “Frank – looking back on my timeline you were one of the only if not only preacher to take time to encourage me while God was blessing me at another level in my ministry!” I have shared for years that Bible college taught us how to exalt Christ but we often fail at complimenting others. Two months ago, I got a call at 7AM from none other than Pastor Chuck. 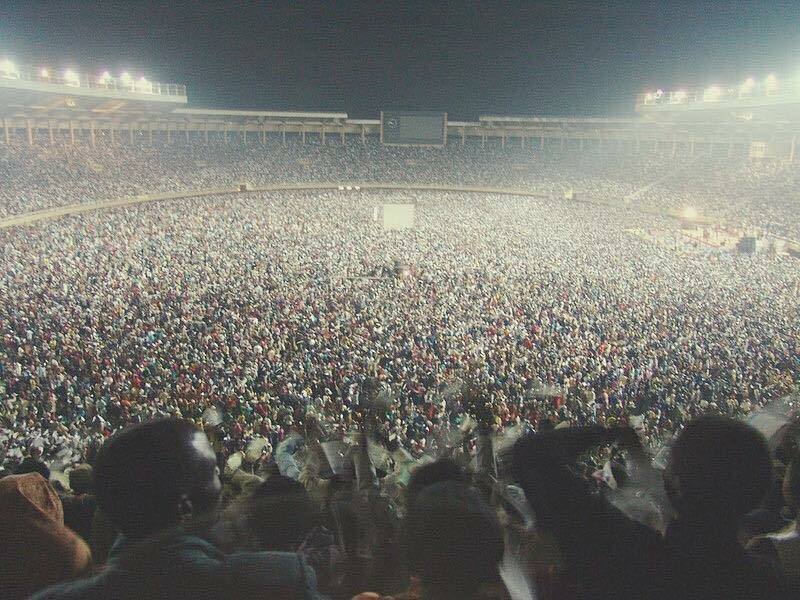 He was not intending to return back to Uganda this year but the pastoral committee in Africa mailed him a poster with his picture on it promoting to all that he was speaking back at the massive stadium to help ring in the New Year for 2017. Pastor Chuck then says, “Frank – I believe God wants you to come with me and I have already asked about you preaching at the stadium and couple other events while in Africa.” LEADERSHIP LESSON – Until we can compliment others in their promotion we may never be ready for our future promotion. Plus, when you honor others – God will honor you. The back story was Pastor Chuck had visited years before and en route to the airport he saw a massive stadium in the distance and he said, “What is that?” When they told him the Nelson Mandela Stadium without missing a beat he pointed out the window and prophesied, “Lord willing – I will be back to preach there one day!” God answers prayer and several years later he was invited to speak last year and this past week again. The same God that made that come to pass for him (Pastor Chuck) now united us together and what an honor it was to share the platform with him and distinguished guests. We serve a faithful God and He is never in a hurry but ALWAYS on time! God has been so good to me and I have been blessed to minister frequently on radio and television and couple conferences and churches but this was the largest crowd (in person) I have had honor to preach. Now the vision from the past was present before my eyes! A hero of the faith to me, Dr Johnny Hunt said, “If you don’t SEE it before you SEE it you will never SEE it!” Some suggest seeing is believing but I learned by believing we see. While on the platform a preacher leaned over to me and said that the minister speaking lost the crowd’s attention and said, “We got to get them back.” I had no idea that after the worship I would be the next one introduced to the pulpit! I said a silent prayer and as I was walking up to the podium the Holy Spirit gave me an idea. One of my favorite Scriptures reads, “If I be LIFTED up I will draw all men unto me.” I scratched the opening greeting and joke and went straight for the jugular. It was not in the notes and God showed up and you can hear in that opening introduction within 60 seconds I introduced them to my Best Friend and a minute later they were on their feet, giving God a standing ovation and as long as I live I will never forget the Roar of that Crowd because of their Reverence for Christ. I shared I tonight I don’t introduce you to a Pope, Prime Minister or President but the Prince of Peace, King of kings & Lord of lords. WATCH video below. The Lord met us in a POWERFUL way! That night after the message, I was invited with Pastor Chuck and a small US delegation of clergy to meet the Vice President of Uganda and pray over him and his nation. 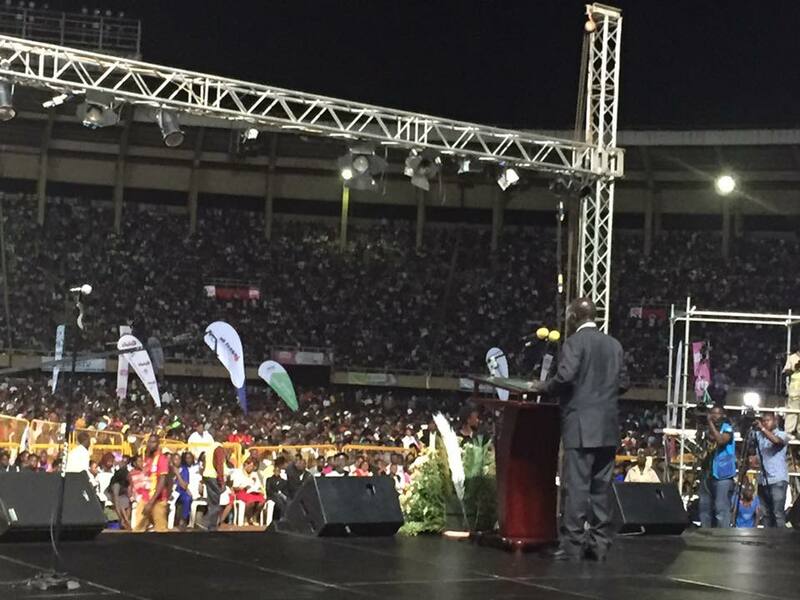 Pastor Chuck gave a word from the Lord for the Vice President and Uganda to become a shining star like never before! What a JOY that was and please pray for the precious people of Africa. Here is the VP addressing the crowd after midnight bringing in the New Year (2017). The next day I was invited to preach at the Pastor’s Evangelism Conference with some powerful men of God. I preached for an hour right before Dr. Hugh Osgood and he oversees one third of the entire churches in England. He was Dr Billy Graham’s UK chairman in 1989 and Dr Osgood serves with Archbishop of Canterberry and meets monthly with the Queen to talk spiritual matters. You can tell on my suit jacket that is NOT a shadow but I was dripping with sweat after preaching! My heart is full but the tank was empty. God rocked the house! A special shout out to Pastor Chuck Balsamo of Virginia. He called me two months ago and invited me to come with him to Africa and God used him to open door for me to preach. It takes a mature person to be humble enough to open doors for another. Glory to God and thank you Chuck! “My precious college roomate, George Odembo is from Nairobi and he played on the Kenya National Soccer Team. Kenya is the neighboring nation to Uganda. Since 1996, I thought it would be wonderful to return together to his continent and tag team minister to his loved ones. Ironically, George played in the same stadium and now I was blessed to preach there. Go God! The morning of the New Years Rally @ Nelson Mandela Stadium the team and I went around and walked while folks were having a sound check. I filmed a video on the ground encouraging folks back home to pray for us and watch it later that evening. The service later that evening started and it was already dark at the stadium. For some reason officials never turned on the interior lights during the service UNTIL the count down to New Years that night. We could sense the excitement but not certain of the crowd. Would they come? Would it be false advertisting back home? My mentor shared decades ago, “Better to UNDER promise and OVER deliver.” We also knew it was for an Audience of One. FOOD for THOUGHT – Why do you do what you do? Are you tempted to throw in the towel when things don’t go your way? Are you tempted to give less than your best when the crowds don’t come? When the promotion destined for you goes to a less qualified person? Do you hold back opposed to give all when from the outside it looks like the cards are stacked against you? That night we made a pack – regardless, if preaching to one million or an individual we would give God all we had. Glory to God – as the announcer counted down ushering in the New Year when it struck MIDNIGHT in Africa making it 2017 fireworks were shot into the sky, the place was going wild and then he quoted the Book of Genesis when God said four words that brought the world into existence……..LET………..THERE…………..BE…………LIGHT! Immediately, the massive stadium was lit and as you can see from picture above the crowd was packed and organizers estimate an additional 20,000 never got in the stadium and camped out listening to it through the massive speakers outside. Another 30 Million watched it LIVE on television spanning FIVE African countries and all glory to God. The take away is that despite in the dark the crowd was always there. Today, on your phone, on your computer and in your corner of the world know this – not just a crowd but CHRIST is there with you. Ironically, He was there all along! Just because its dark doesn’t mean The Light is not present. He is there in the good, bad and ugly and you can be encouraged that He goes with YOU in 2017. To God be the glory – Great things HE hath done. Frank – Very proud of all God has you doing! Keep spreading the Word! Breathtaking!! My friend, Frank Shelton, is on fire for God and doing great things!!! Evangelist Frank Shelton will be with us at our church Kingdom Life Worship Center International Brooklyn NY in January save the dates!!! Frankie just called us via Facebook (don’t ask me how that works!) and said that while he will be leaving Africa today, Africa will never leave him! He has fallen in love with the Ugandans he has met in the past few days. So thankful to God for the wonderful example of faith and love demonstrated by the Ugandan people. I will be praying that some day, 100,000+ Americans will joyfully and peacefully assemble in stadiums all across the USA to praise and worship God. It’s so exciting to see our chaplain spreading God’s good news to the people of Africa! Our students can’t wait to hear all about how God is moving there! Thank you for your faithfulness Frank Shelton! Was honored to pray for u…. what a great event for The Kingdom…. awesome!! How awesome to see the multitudes coming out to receive the blessings being bestowed! Thank you for your love of the Lord. I pray continued safety in your travels. God Bless you and the team! Love you! Frank, you remind me of a young Billy Graham preaching in that stadium. When you said you never met the translator before preaching you would think you had been long lost friends. God has really given you a gift. Not anyone could get up there and connect with that stadium and draw the net. Cheering you on and we got to get you back in our neck of woods soon. This was the crowd that my dear brother in Christ Frank Shelton spoke to on Saturday night in the Nelson Mandela Stadium. Over a 100,000 people came to hear God’s Word. Oh if only America would turn to God we could definitely make America Great Again. Thank you brother Frank Shelton for serving God and spreading the Word where ever God leads. I know how touched and moved you must have been to see such a site, God Bless and we love you in Sebring, Florida. My friend Frank Shelton knocking it out of the stadium for the Lord….estimated 100,000 in attendance and 30 million on tv. This brother can preach the Lord’s word! And the awesome thing about brother Frank….He will bring the word to just one or to 100,000 plus! He is an awesome evangelist and on fire for the Lord. Please continue to lift him up in prayer and the whole team that he is with while over there! Frank – COME BACK TO TEXAS!! 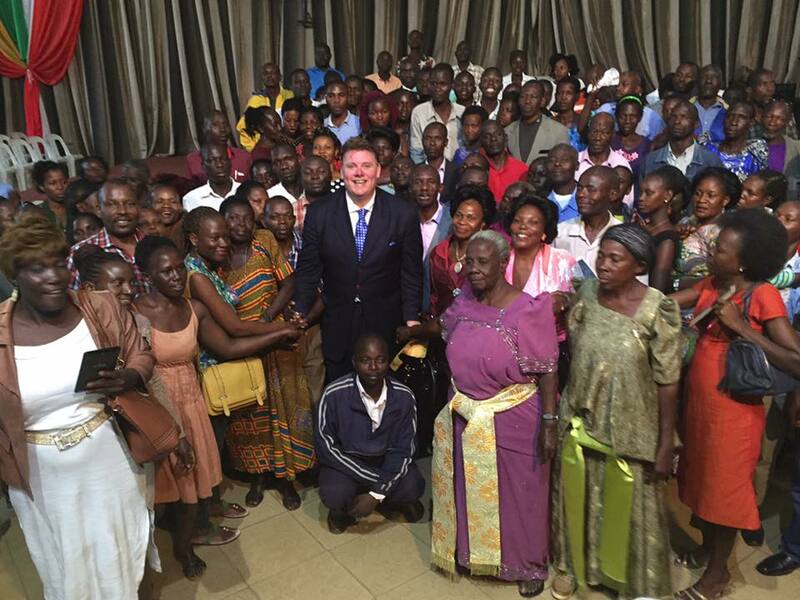 New Year Eve……..my dearest Friend, Pastor Frank Shelton, preached in Uganda in front a 100K…..that’s how God work….for humbled preacher who accepted to spoke at Romanian Churches in Phoenix for 100 people, God open the door to preach for 100K……God blees you Frank, God bless your amazing start in 2017!!! If you think God’s not doing something great in the world, my friend Frank Shelton was at Nelson Mandela Stadium in Uganda preaching. Look at the size of that crowd.